Liz questions Franco about Tom&apos;s whereabouts. He denies any wrongdoing. Liz is called away. Seth is certain that Franco has done something and warns he&apos;ll call police. Franco claims that Tom is out there causing trouble. Tom manages to get himself out of the cage, but finds the studio door locked from the outside. Emma wonders why Anna is so interested in Charlotte&apos;s song. Anna tells her that it sounds familiar to her. Emma questions why Anna doesn&apos;t like Valentin. She offers to spy on him for her grandmother. Anna refuses to allow that. To Lulu&apos;s disappointment, Charlotte wants to go home to her father rather than spend more time with her and Dante. Lulu&apos;s not happy when Valentin shows up to pick-up Charlotte. Laura&apos;s waiting for an interview to join the hospital board. Kevin realizes that would make her his boss. Lucy interrupts. She wants to ask for a favor from Laura once she&apos;s on the board. Later, Kevin apologizes for putting Laura on the spot when he told her that he loved her. Laura tells him that she loves him too, and the two kiss. Hayden goes into cardiac arrest. Finn and Liz are forced to save her with a combination of shocks and yelling. Liz overhears Franco tell Seth that he&apos;s changed his bad ways because of her. Liz tells him that thanks to Hayden&apos;s near-death experience, Liz has decided to stop wasting time and embrace her time with Franco. The two kiss. 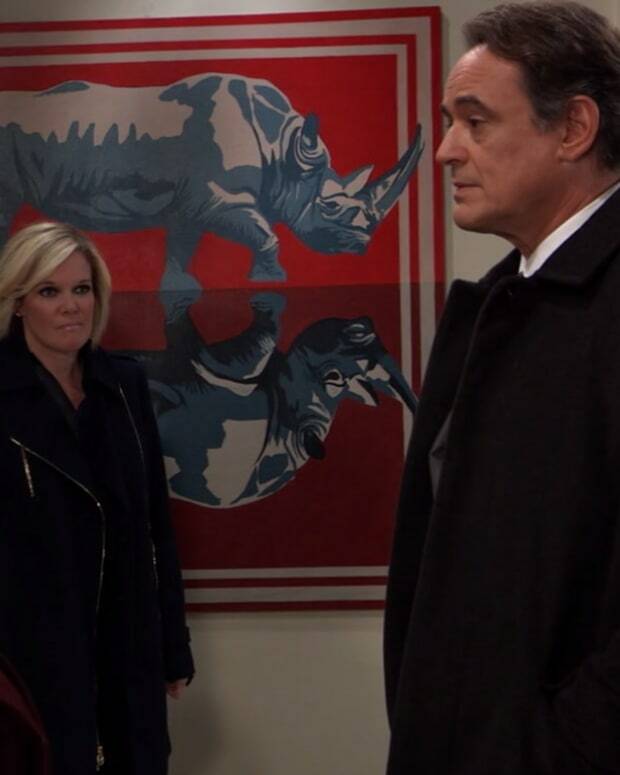 Lulu tells Dante that she&apos;ll fight for full custody. Dante points out that Charlotte doesn&apos;t know her and that she can&apos;t take Charlotte away from the only parent she knows. Finn tells Hayden that he has either a possible cure or a death sentence. Hayden worries what will happen to him if she takes the medication, but Finn reassures her that he&apos;ll will himself to live. Finn gives Hayden the shot. Anna asks Valentin about the song. He says it was in Russian. He tells her a story about his childhood, which strikes a cord with her. Anna tells Dante that the story was from her past, most likely when she was training as an agent. Franco heads back to the studio to release Tom. Tom attacks him.